Dr. Mulcahy has been a practicing urologist and surgeon for 30 years. He now is in private practice in Goulburn and Canberra. The target patients are both male and female patients - 75% of which are cancer-related (Prostate, Bladder and Kidney), and other common services conditions such as BPH, Kidney and Uterine Stones and Urethral Strictures. The purpose of this new Urology surgeon website is to not only rank but also engage visitors looking for the practice’s services. 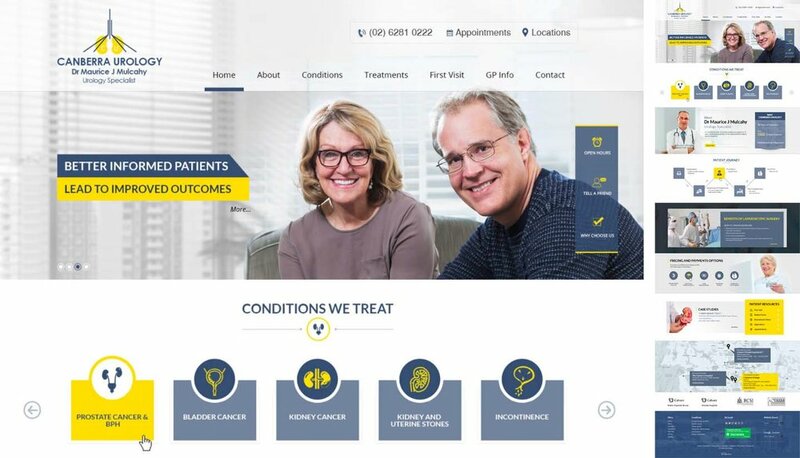 The medical website design needs to be patient-focused, visually engaging, and address patients’ needs and questions. The website design needs to needs to support the patient's’ sense that CU is the right choice (or better the only choice) for some procedures. As well as reinforce the message that CU offers a professional, caring, safe, and personalised service solution.